Japan Geisha in traditional kimono playing the shamisen. Home » Japan Geisha in traditional kimono playing the shamisen. Japan Geisha playing the shamisen. 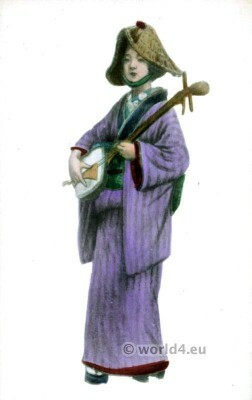 Japan Geisha in traditional kimono playing the shamisen 1910s. This entry was posted in 10s, 20th Century, Asia, Headdresses, Japan and tagged Traditional Japanese costume on 12/10/14 by world4.